I have a quick announcement & an awesome Power Pivot technique to share with you. First the announcement. 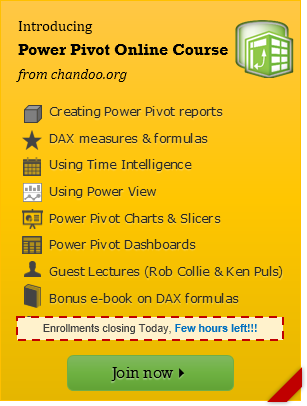 As you may know, I have opened enrollments for our inaugural batch of Power Pivot course few days ago. The aim of this course is to make you awesome in Excel, Advanced Excel, Dashboards & Power Pivot. We will be closing the doors of this program at midnight, today (11:59 PM, Pacific time, Friday, 15th of February). If you want to join us, click here and enroll now. How many people have joined the class? At the time of writing this, we have 195 students enrolled in Power Pivot class. We are eager to share Power Pivot knowledge & techniques to as many more of you as possible. 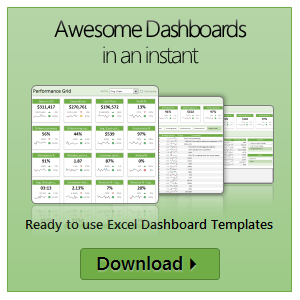 So go ahead and join us because you want to be awesome in Excel & Power Pivot. Count-down Timer App in VBA to Remind you about the VBAClasses Closing Time!!! Here is a cool count-down timer application made in VBA to remind you about our VBAClasses registration closing time! Read the rest of this post to learn how this particular app is built. If you want to learn VBA, then click here to join our class.